Keyforge - What's a Quadrillion!? Some of the biggest news to come out of Gen Con is from Fantasy Flight, and one of the biggest, most epic, colossal names in game design: Richard Garfield. (He designed this little card game called Magic the Gathering, maybe you've heard of it?) The title I'm talking about today is Keyforge. 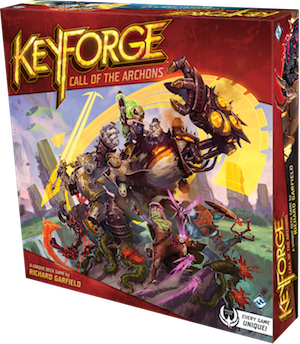 Keyforge: Call of the Archons (to be accurate), is a 1 vs. 1 card game where players are racing to forge keys (get it? Key.... Forge?) that unlock the vaults of an artificial work at the center of the universe... Ok, ok, that’s a paper thin theme, but what's fascinating, mind-blowing, and seemingly near impossible here is the fact that the game features decks, that are completely, 100% unique. As the Fantasy Flight website says "What this means for KeyForge is that every deck in existence is utterly unique and different from every other deck." Of course the feeling around TOG is maybe more accurately described in the words of They Might Be Giants, "Everyone's excited and confused..."
We have no delusions of being mathematicians, or quantum mechanics, or whatever sorcery was whipped up to make this possible, but Fantasy Flight is touting a possible 104 Quadrillion unique decks for the game! We have questions. We aren't even sure what they are yet, but we have questions, such as: Is the game balanced? Are the people playing in Poughkeepsie having the same experience as folks playing in Albuquerque? How varied is the game play from the 1st deck to the 104 quadrillionth? Exactly how many is a Quadrillion? One thing I like (and I think the rest of the TOG guys agree) is that you can simply grab a deck, and play with it. There's no card chasing, no drafting, deck construction, none of the things that take up time, money and brain space that we can ill afford away from the game table. The biggest decision is which 3 of the 7 factions you will play with. So there it is. What questions do you have about Keyforge? Do you think this is a gimmick to sell games, or a legit mechanism that is exciting and new? Let us know in the comments below! We've written Fantasy Flight Games requesting some decks to take a look at. If they should grace us with a few, we'll let ya know how the game plays, very very soon!